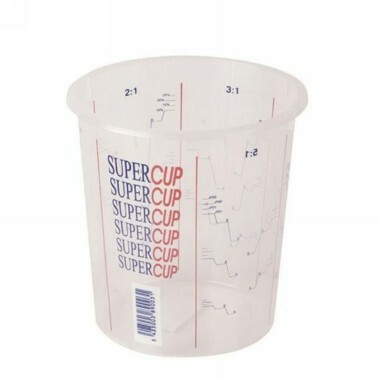 A premium paint mixing cup made from thick, rigid polypropylene. There are calibrations showing volume in millilitres and mixing ratios 2:1, 3:1, 4:1 and 5:1. Apart from being extremely accurate, these calibrations can be read from the inside of the cup. Can be used for accurately mixing paints and lacquers. They are also an economical alternative to paint tins for transporting mixed paints to the end-user. FEATURES Strong construction Accurate calibrations and mixing ratios Suitable for short term storage and transit of paint - cheaper than tins.